Using the chakras for personal growth and healing offers a powerful way to understand and release emotions while expanding into greater levels of awareness, peace and joy. My approach to the chakras is not so much energetic, but to use this framework for deeper understanding of the mind/body connection. For example, I’ve been struggling with a lot of fear and feelings that I’m not good enough. Last night and again this morning, I meditated on this fear for a long time, just sitting with it and noticing where it appeared in my body. Download the meditation I use to transform emotional pain into peace below. The fear felt like a black ball of energy in my heart. This makes so much sense because to dissolve fear, we return to love. Love is all encompassing. Its presence is unconditional. Lately I’ve been falling into more new thought systems that are obsessed with the mind, unraveling limiting beliefs, manifesting my desires, and the thing is, this stuff works. It truly does. But one question I always ask myself is, “do I like the person I’m becoming?” And for a little while now, the answer has been, “I’m not sure.” That is not the answer I want to hear! And last night, sitting with this fear, I realized why. The greatest joy and peace in my life has come from just embracing everything I feel and trusting that as I sit with the energy of whatever pain I’m experiencing, the practice of sitting with that feeling, which comes from the intention of love, will eventually dissolve it, leaving peace in its wake. And when this feeling dissolves, the thoughts related to that feeling will also dissolve because I truly believe that feelings create thoughts, and not the other way around. When we free ourselves from painful feelings, by sitting with them in pure present awareness until they dissolve, our minds naturally expand and elevate because they’re no longer clouded from fear. Our minds are powered by the energy within us, and when we spend our time connecting to the presence of love, it allows that expansive energy to power our minds. We truly don’t have to try so hard to do anything. Heal. Realize our dreams. Shift our false perceptions. All we have to do is trust our process, even when it feels messy and have the faith that if we cultivate a deeper, more all-encompassing understanding, then we will heal on our own. Because that is what we were born to do. With that, let’s begin with the first post in this series on using chakras for personal growth and transformation. Generally speaking, the root chakra is the one closest to the Earth, and so it relates most dramatically to manifestation, which is just another word for making real. Heavenly energy flows into the crown chakra at the top of the head, and filters down through the energy centers — with the universe and humans— to manifest in Earth the planet, and the body for humans. The human body is the literal manifestation of heavenly energy, the soul in human form. However, in the microcosm of the body, the root chakra is at the base of the spine. Physically this chakra relates to the legs and feet, and also the adrenal system. This is all about survival, and overcoming our fears of survival are necessary for following our dreams. This makes total sense: When you’re rocked by trauma or uncertain where your next meal is coming from, you’re not thinking about self-actualization. You’re grieving or consumed by basic survival needs. 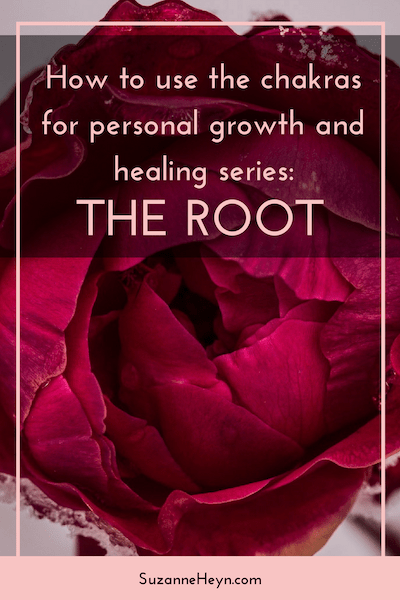 If you’re in the healing phase, honoring the root chakra requires you to trust this experience so you can fully open up into it. Healing comes from acceptance, which is only acknowledging that it’s here, happening, and your task is to learn and find the love. No matter how dark an experience is, there are always hints of light because nothing is all good or all bad. Ultimately, we all have the gift of turning our pain into purpose and passion, but to do that, you have to fully accept it and integrate the experiences. Related to this conversation, following your dreams requires you trust life, which I define as trusting that all experiences hold meaning and possibility for expansion. Trusting in life pushes us to open up to this potential and release our human fears to return to the truth of love. Love has space for fear because love is all encompassing and has space for everything. Fear is not separate from love, but can truly only be dissolved through love. Trusting in life requires us to release the tension we hold in our bodies, the stress, doubt and fear, and instead fully let go and allow the Earth to support us. This is the gift (and the challenge) of the root. When following your dreams, be fueled by faith, not fear. Physically, the root chakra relates to the adrenal glands, which release cortisol to support the fight-or-flight reflex. So many of us live amped up on cortisol. We may think we have tons of energy, but we’re actually riding on an adrenaline high. This has happened to me so many times, and I always crash and burn. To release this feeling, it’s important to tune in and begin to notice when you truly feel energized, which should still have a sense of calm groundedness, and when you feel manic or crazy. This mania comes from adrenaline, and a crash is sure to follow. One truth that I’m constantly working to embody is that if I have a life purpose that comes from beyond me, I don’t have to struggle and fear that my dreams won’t come true. I have to trust that I have everything I need, and that the swiftest momentum comes not from obsessing over every detail and worrying that I’m not good enough, but rooting down in the faith that I’m exactly where I’m supposed to be. I have everything I need. And that every love-filled step I take expands in ways I can’t even see. And this is the antidote to the fear and anxiety of the first chakra. Slow down. Take deep breaths. Reconnect to the Earth. Watch the moon and remember the cycles of life. Spend time outside. Lie on the floor. Trust that you are supported by a force far greater than you. This is the challenge and the gift of the first chakra. How embracing limitation helps you realize your dreams. Another aspect of the root chakra that supports the fulfillment of our dreams is limitation. This may not be obviously true, but clarity is a pre-requisite to action. The Earth has taken form in specific shape, just like we have a specific color of eyes and body shape. Energy is unlimited, but our Earthly selves are very limited. They have to be in order to exist. Dreams are achieved by taking small, steady steps in the right direction daily. Yet, many people get stuck in the dreaming or idea phase and never access the limitation (or clarity) necessary to turn idea into action. It can feel scary to choose a path, to let go of some dreams to make one true. And you can do many things, this is true, but you can only do one thing at a time. So choose one thing, give it your all. Then, assess and redirect if necessary. You can always shift later, but the important thing is to take action today. Did this article on chakras for personal growth resonate with you? If it did, please share it and tell me your comments below. Also be sure to sign up to my blog below to receive the rest of the posts in this series. That sounds powerful. Would love to know how that goes for you. Thanks for sharing! Enjoyed reading this Suzanne. My morning meditation was all about clarity and slowing down so this resonated with me. I look forward to reading this series! So glad to hear it resonated. Sounds like an awesome meditation you had! Thank you, this was encouraging and motivating for me. Just what I needed to read today! Thank you Suzanne. I look forward to reading more articles from you. I always get excited to open up my emails from you and see what I’ll learn about healing my heart. Thank you. You are appreciated! That’s so awesome Semira! Thrilled you enjoy the emails.